My Fitness Pal is a great way to track your daily food intake. The only complaint I have about MFP is that you can’t use the exact precents that you get from your Keto Calculations because they only allow you to use 5% increments (which really isn’t that big of a deal if you write down your actual numbers for Carbs, Fat, and Protein because you will know whether you are over or under). So with that in mind, let’s use My Fitness Pal Keto to quickly and easily track your foods, while remembering that the totals will be a little off. My Fitness Pal is awesome because they have thousands of food listed in their food catalog with most brands listed as well. This takes the guess work out of eating out, or eating foods that you may have trashed the packaging for. It’s also makes it easy to plan meals out before hand to meet your daily needs. You can do this once a week or every morning. This helps you to pack lunches, and know exactly what meals you need to prepare every day. 1) To get started go to My Fitness Pal and set up your account. If you already have an account just sign in and make the necessary changes below. 2) Choose your username and password. 3) Enter your personal stats. If you need help figuring out a goal weight, head over to the My Fitness Pal BMI calculator (in a new window) and take a look at the weights listed to choose a healthy weight. This is also the point where you can decide how much you will work out. I personally started this diet with no workouts (other than what I did naturally during the week) so I could experience the side effects (if any) without adding stress from workouts to the mix. I also prefer to give my body a chance to slim down before packing on muscle, which can make you both gain weight and look bigger. 4) At this point MFP will give you their recommendations based on the information you provided. You can disregard this as your weight loss will most likely not work like this. These numbers are based on the typical American food pyramid standards, and you my friend are about to embark on a different kind of journey! Expect to lose more… that’s basically what I’m saying. Everyone loses weight differently, and there will possibly be weeks when you lose no weight and only inches (but never fear, inches are great). You can read this post for more info: Why Am I Losing Inches But Not Weight? 5) Now for the fun part! 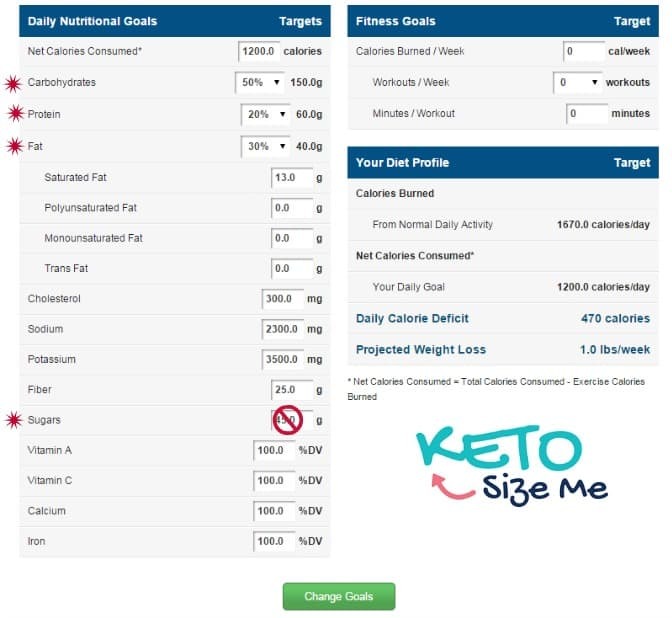 If you haven’t already done so, head over to the Personal Keto Macro Calculator post and figure out how many grams of carbs, fat, and protein you need each day. Now that you have your numbers it’s time to enter them into your personal calculations. 7) Using the percentages you got in Step 5 the only changes you need to make are Carbohydrates —> Protein —-> Fat —> and Sugar (which you should put at 0. Note: You will go over 0 with natural sugars from fruits and dairy, but you always want to be as close to 0 as possible. Never use products with added sugar (read your labels). As I mentioned, you will not be able to use exact numbers, but these percentages have to equal 100% so get as close as possible. No other numbers have to change. 9) The only thing I want you to change here is Sodium. You don’t need to worry about this number, instead change it to Fiber. You will need to know your daily fiber count so you can keep track of your net carbs. Don’t know what this means? Check out How To Figure Net Carbs . You can change any of the other settings to your liking. 10) Don’t forget to download the My Fitness Pal app so you can track your food everywhere you go! You have officially set up your account to give you the best tracking system for your daily food intake and food planing for the Keto Diet Plan. Now you can go under food and start adding foods by searching in the box. Once you have added foods, you will notice that they come up under recent and frequent making logging your food intake even faster. 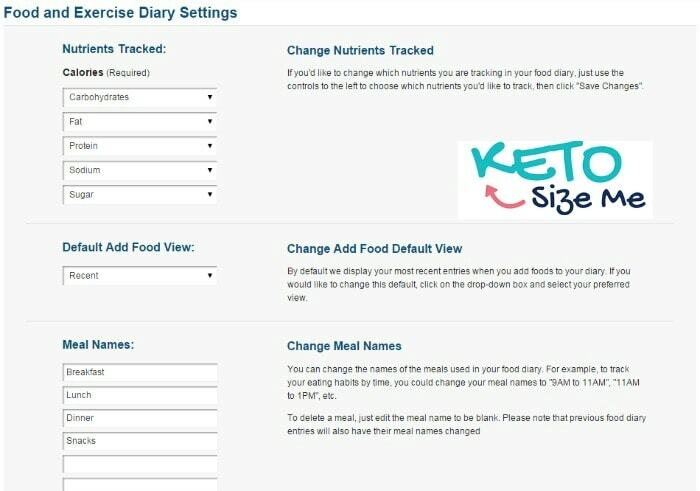 You can also create your own recipes and easily add them to your food diary using the recipes button. Take some time to look around the site and get a better feel for it. You will be a pro in no time! I hope you enjoyed this tutorial and found it helpful! Looking for ketogenic diet recipes click here. * I am not a doctor or a scientist! I only share what has worked for me, and many others. If you have questions related to your health you should speak with your doctor or favorite scientist if you have one. I plan on getting the paid version of My Fitness Pal so I can set my carb and protein goals at a specific number instead of a percentage. I couldn't get this to work for me today. I never saw the green "change goals" tab. Please help!